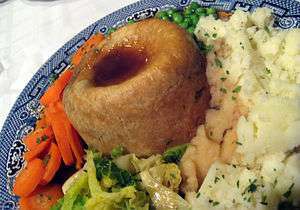 The first recipe for steak and kidney pudding to appear in print came from Sussex, in a book by Mrs Beeton published by Ward, Lock and Tyler in 1861. Though the dish is far older than published recipes of the 19th century. In the slang of the British Armed Forces and some parts of North West England, the puddings are called "babies' heads"
↑ Beeton, Isabella (1861). The Book of Household Management. London: Ward, Lock and Tyler. pp. 281–282. ↑ Fulton, Margaret (2007). Encyclopedia of Food and Cookery: The Complete Kitchen Companion from A-Z. London: Apple Press. p. 506. ISBN 1-84543-229-0. ↑ Hyslop, Leah (2013). "Potted Histories: Steak and Kidney Pudding". London: The Guardian. Retrieved 11 January 2016. ↑ Seal, Graham; Blake, Lloyd (2013). Century of Silent Service. Salisbury, Queensland: Boolarong Press. p. 6. ISBN 978-1-922-10989-7.